i know it can be a bit overwhelming, but read through the comments where needed for clarifications. Any questions is welcome though. I'm trying to figure a few things out, if you don't mind me asking? -Where do you see the values of each vehicle after the various FI periods invested? -When I input 100% of salary, it messes up the calculations somewhere and doesn't output the data in the 4 Results(FI test after X Years) as per attached. You know why? never a bad question . seems like you uncovered a possible bug added recently, i will try and correct it when time allows. Trying your values, the Div/0 error comes in when you enter the homeloan and car values. For now make it R100 per month for a year - it should be basically ignored for most of the calculations. Where do you see the values of each vehicle after the various FI periods invested? 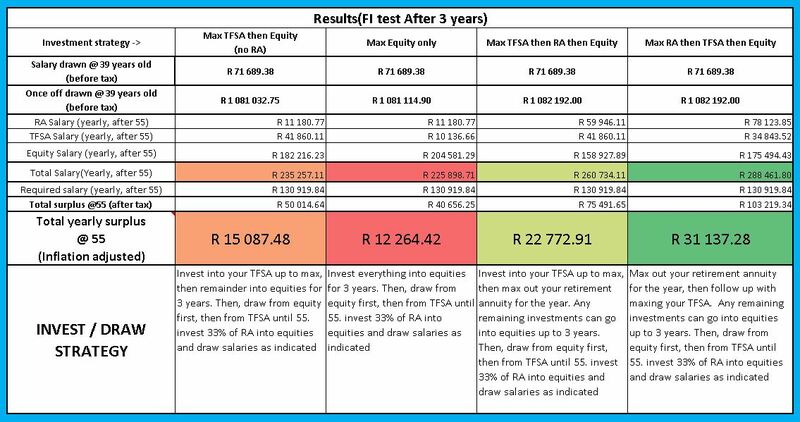 Is there somewhere in the sheet to see what the monthly contributions to RA, TFSA(R2500) and Equity contributions are monthly/annually till FI is reached based on the inputs? This just to verify how close this is to reality. Hmm, ok I understand that & why you did it that way, and that it's a way to reverse engineer using those numbers because who in reality can save 100% of their salary. But would you somehow be able make it work without the "reverse engineering"only when you input 100%, for someone that wants to be able to commit 100% or through other means can do so(lets pretend they can live without touching their earned salary during this growth phase ) but with an expectation that after FI is reached they want that income inputted in "Monthly Spending buffer after FI" without it affecting the calculation? Hope that makes sense? You see the idea is the 900,000k "Once off spending buffer at FI" is to settle a rental property for instance that will then provide another portion of income, hence the lower "Monthly Spending buffer after FI" figure which will complement this income to make up for the "real" requirement once FI is reached. hmmmm - this goes much deeper into the inner workings of the sheet. this does not stay constant, especially considering the different investment strategies. (my whole idea behind the calculator was due to RA's having lower returns than equities- even on monthly basis. Thus pushing more cash into a 20% equity return, does it have a better financial gain than sending cash into your RA first? anyhow - if you really like looking at the numbers, go to each sheet, and look at Row 283 onwards. This gives the value of the investments and how much is added to each ( columns F , I and K) ,and the resulting value after that month's interest (columns G J and L). Dont think that can be summarized (expenses inflation vs salary increases is not supposed to stay the same which is why i seperated it on the inputs). ah hmmmm. yes investment properties is a completely different ball game. unfortunately, my initial thought is that in the current state the calculator cant cater for this - too many variables ( rental income in x years will be ??. Rental expenses in x years... etc etc.) - Tax to be paid due to rental income in x years = ??. dont think its feasible to reverse engineer current input values(my personal feeling from rental properties ( Thank you Patrick ), is to avoid them like the plague. Rather choose a REIT fund. but yes that's just me. Thus my best recommendation then for now is to leave the 900k once of buffer in equities ( eg change buffer to 0). The calculator will then use the cash available in equities to show you salaries possible from that amount. Thus you should be able to safely achieve FI after 3 years ( or even less due to rental income). at 55 you will have R5000 + R2594 available to spend + rental income. i would however recommend that you push inflation to a more comfortable value (maybe 8%? ), but even then rental income should provide a nice buffer. * Added functionality to add retirement annuity deduction as per payslip. (caution - this is kept constant throughout the calculator and adjusted as per your pay increases. Any other contributions towards an RA will be after tax, and tax returns will be re-invested). Although some checks is in place, please double check that your RA deduction is not greater than the allowed SARS Tax benefit. * Summary screen was updated -with a total Portfolio value, and some readability/formatting. I do admire the effort you placed into creating such a spreadsheet/calculator. Do you have a separate calc for your equity portfolio and its growth prospects including dividend reinvestments? hmmm wont call this a calculator as such ( although i have tried implementing a scoring system based on different "rules" (expand the top 20 rows of the sheet to see them). Have only been running it for the past year, thus the one question still nagging in my mind is how will i do re balancing should the need arise. Shares highlighted green is the ones i currently have in my portfolio. 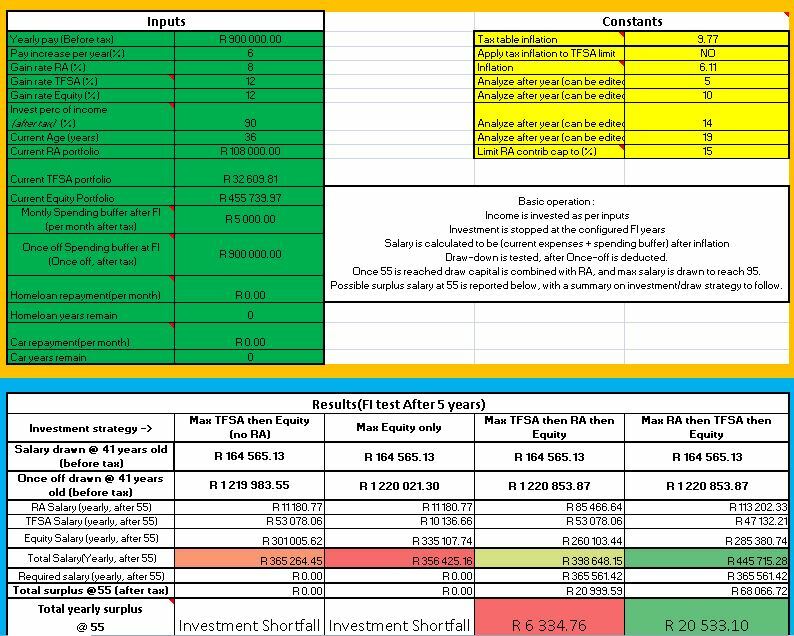 I try to update the fact sheet data every few months, but this one is about three weeks old so should be more than ok.
all share performance shown includes dividend reinvestment. updated tax tables as much as possible, but had to skip one of the "brackets" due to a new bracket introduced. shouldn't be too much of a problem though. This is very cool, Erwin! Thanks a lot for providing it! Playing around with it a bit to try and understand everything. Is it a bug that scenario 4 is sitting on 33,000 for the TFSA while scenario 1 and 3 are sitting on 66,000?